The Epcot International Festival of the Holidays is a festival event at Epcot during the months of November and December featuring specialty food, entertainment, and merchandise. In this post, we’ll cover everything you need to know about the Epcot International Festival of the Holidays. We’ve started making updated where 2019 information has come out, but everything you’ll see or read about is based on the 2018 event, unless otherwise specified. Let’s get some basic information out of the way. What is the Epcot International Festival of the Holidays? While there is a Christmas celebration at Hollywood Studios (Flurry of Fun) and Mickey’s Very Merry Christmas Party at Magic Kingdom, there’s no simple “Christmas at Epcot” event. Instead, Epcot seizes on its international and festival talents to throw together the Epcot International Festival of the Holidays, celebrating various holidays (including Christmas) from around the world! The festival is essentially a holiday transformation of the World Showcase, along with select areas of Future World. There is unique holiday food, decorations, entertainment, and merchandise. When is the Epcot International Festival of the Holidays? The 2019 Epcot International Festival of the Holidays will be held November 29 through December 30. How much does the Epcot International Festival of the Holidays cost? The festival itself is included in the price of admission to Epcot. This isn’t a special ticketed event like Mickey’s Very Merry Christmas Party at Magic Kingdom. If you want to enjoy the special holiday food or merchandise, those come at an extra cost. Festival of the Holidays offers food booths that are similar in concept to the booths at Food & Wine. In fact, most of the physical structures are exactly the booths from Food & Wine, though they’re re-themed and feature different menus. If you’re completely unfamiliar with Food & Wine, these are basically pop up booths around the park that offer small portions of food and beverage for around $5 an item. 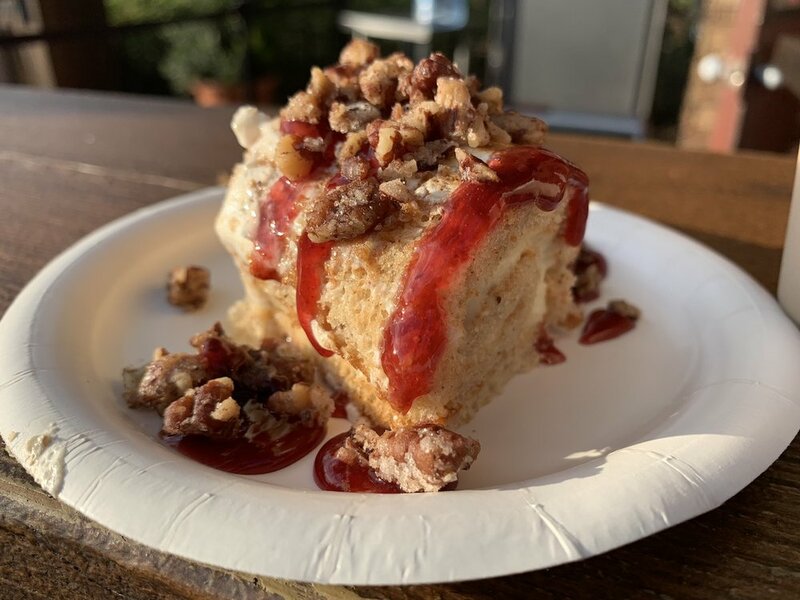 Most of these items count as snacks on the Disney dining plans, and these are one of the best ways to use your snack credits. Most of these booths are themed to countries, but a few just carry a generic holiday or festival theme. Altogether, there are 14 booths, most of which are around the World Showcase. For the most part, each booth offers at least one food item, one dessert one alcoholic beverage, and one non-alcoholic beverage. As vegetarians with very little interest in food, we can’t offer much by way of food recommendations. The performances divide roughly into two groups—musical/dance performances and storytellers. Musical/dance performers put on straightforward holiday-themed performances (sorry this description is wildly unhelpful). The storytellers are a little more interesting, as they explain the holiday traditions from their countries of origin. Father Christmas in the U.K., Père Noël in France, and Le Befana, the witch of Italy, are some of these storytellers. The feature performance of the Festival of Holidays is the Candlelight Processional, a 40-ish minute holiday performance featuring a choir and 50-piece orchestra. Besides being a stunning performance, one highlight of the Candlelight Processional is that it features a celebrity host. Some of 2018’s hosts include: John Stamos, Whoppi Goldberg, and Neil Patrick Harris. Hosts vary day by day and week by week. The Candlelight Processional is held three times each day in the America Gardens Theatre. We recommend Disney Tourist Blog’s tips for how to see the Candlelight Processional. Finally, IllumiNations: Reflections of Earth, the nightly firework show at Epcot, features a special holiday ending. Festival of the Holidays features two notable activities for guests. Chip & Dale’s Christmas Tree Spree is a park-wide scavenger hunt. Maps cost $6.99+tax. Complete the scavenger hunt for the Chip & Dale figurines, and you’ll earn a prize—a pack of greeting cards. To participate in the Holiday Cookie Stroll, purchase five designated cookies and receive a free completer cookie and glass of milk. We’re going to break down the decorations by area / pavilion, providing a slideshow of some highlights from around the park. Be prepared, there is a lot of garland, a lot of wreaths, and a lot of trees. We’ll also cover what entertainment each pavilion offers (along with a picture in the slideshow, if we have one). The United Kingdom features storytelling by Father Christmas. Canada features a performance by The Canadian Holiday Voyageurs. Mexico features performances by Las Posadas Celebration. Norway features storytelling by Sigrid and Julenissen, the Christmas gnome. Germany features performances by rock band Durch & Durch. Italy features storytelling by La Befana, a holiday witch. 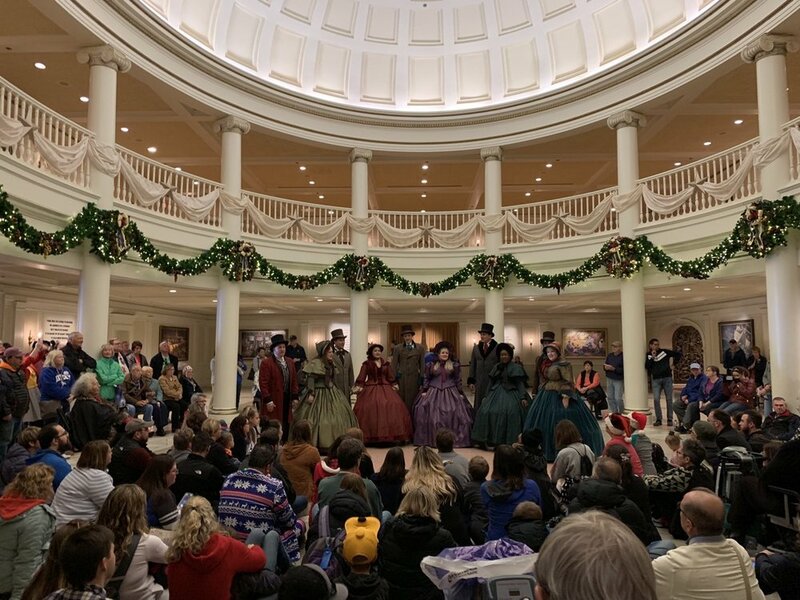 The American Adventure features both a character greeting with Santa and Mrs. Claus and holiday performances by the Voices of Liberty as the Dickens Carolers. The Candlelight Processional is also held daily at the America Gardens Theatre. France hosts storytelling by Père Noël. Between Morocco and France, you’ll find “L’Chaim! Holiday Kitchen” serving Jewish food alongside the Hanukkah Storyteller. The Morocco Pavilion features performances by Sahara Beat (a regular performer at the pavilion). The Japan Pavilion features storytelling by Daruma Storyteller, who tells the audience about Japanese New Year. Finally, the China Pavilion has performances by the Chinese Lion Dancers. We want to close with a quick practical tip. If you’re in Walt Disney World on vacation, we highly recommend avoiding Epcot during any time locals are likely to visit the festival—evening, weekends, and holidays. The World Showcase is a significantly better experience on weekdays around noon than at 4PM on a Saturday when festivals are going on. Do you have any questions about Epcot International Festival of Holidays? Want to learn more about Christmastime at Walt Disney World? For starters, we've got a Guide to Christmas at Walt Disney World, which introduces you to everything you need to know. Need more specifics? You'll want to read about the park that gets the most Magical decorations in our post on Christmas at Magic Kingdom. You'll also want to read about Flurry of Fun—the Christmas celebration at Hollywood Studios—and the Epcot International Festival of the Holidays. But the flaghsip event of the season is Mickey's Very Merry Christmas Party—and our guide has you covered with everything you need to know. Or check out the quick version in our 12 Tips for Mickey's Very Merry Christmas Party. Last but not least, let's not forget that the celebrations don't stop at the parks! You can visit our post on Christmas decorations at the Disney World hotels to see how even the hotels get into the spirit!